An overseas website is reporting that Warner has announced a French Blu-ray of 'The Goonies' for this October, fueling speculation that a domestic next-gen release is soon to follow. According to a report from PlanetaHD, Warner has issued an October 15 Blu-ray release date for the Richard Donner cult classic, even going so far as to release an advert with box art to the overseas trades. Reported specs for the release include 1080p video and Dolby TrueHD 5.1 Surround audio. Supplements will mirror the previous standard DVD, with a video commentary with Donner and the film's young cast, a featurette, deleted scenes and a Cyndi Lauper music video. At press time, Warner has neither confirmed nor denied plans for a 'Goonies' debut on Blu-ray, but with the overseas release looming, indications certainly look good that the studio will soon be announcing a companion domestic release. As always, we'll keep you updated as any official news comes in. 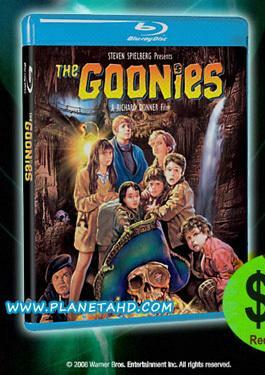 In the meantime, we've added 'The Goonies' to the "Release Dates Pending" section of our Blu-ray Release Schedule.